Haynie also said he has received a “request for clarification” from the state’s Environmental Protection Division in response to the county’s application to be allowed to release additional treated wastewater into Calls Creek, possibly making it unnecessary that the county build a discharge pipeline. Haynie said he was “gathering additional water consumption projections” to address the questions raised by the EPD. Also last week, Chris Manganiello, policy director of the Georgia River Network, wrote to the EPD saying the Georgia River Network has “serious concerns about EPD revisiting” its decision about Calls Creek’s waste load allocation for treated sewage because of the current "impaired" status of the creek. Haynie, in am email message he sent me on Friday, did not identify the routes for a sewage pipeline that the engineering firm PPI, with offices in Monroe, has under consideration. 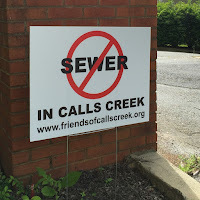 In February the county announced that the firm would be doing survey work in the Calls Creek corridor for a 24-inch sewer line that would carry treated sewage water from the plant just off North Main Street outside Watkinsville to the Middle Oconee River. The pipe would be necessary if the county goes forward with plans to upgrade its existing plant to 3 million gallons per day of discharge and the EPD does not increase the waste load allocation the county already holds. That allocation allows the county to discharge up to 1.5 million gallons per day of treated water to the creek. Haynie admitted in a series of meetings earlier this year that the county had not considered other options to the Calls Creek pipeline, but residents who have organized in opposition to the pipeline suggested using a power easement east of the plant, Simonton Bridge Road, or U.S. 441 as alternate routes. “We appreciate your consideration to expedite the modification of our WLA for 1.5 MGD and the development of a new 3 MGD WLA,” Haynie wrote. WLA stands for waste load allocation. The EPD first determines the ability of a stream to handle treated sewage water and then allocates that ability to applicants. The EPD in 2007 determined that Calls Creek could handle only 1.5 million gallons per day of wastewater and allocated all of that to Oconee County. TMDL stands for Total Maximum Daily Load, or waste load handling determination. “In the TMDL process,” Manganiello wrote, “EPD used scientific indicators to establish the 1.5 MGD WLA. “The creek simply cannot handle receiving twice the amount of treated effluent, which could have water quality implications as well as degrade the physical integrity of the waterway through scouring and erosion,” according to the letter. “Revisiting this science-based standard sets a dangerous precedent for other waterways around Georgia and risks violating the state’s antidegradation policy,” Manganiello wrote. He asked for a meeting with Causse to discuss the options. Georgia River Network, with its offices at 126 South Milledge Avenue in Athens, was founded in 1998 to be an advocate for Georgia rivers and streams.